Located in Suizhong Town, Suizhong County of Huludao, Tianlong Temple Beach provides the fantastic seascape of soothing beaches, clear waters and flocks of sea birds. It's a yet-to-be developed natural seashore with fresh air and clean environment. In addition to viewing the beautiful seascape, tourists can also rent a boat to enjoy an exciting trip of fishing on the sea. The magnificent Tianlong Temple, first built during the reign of Emperor Qianlong in the Qing Dynasty (1644-1912), is located in this scenic area. Comprising the elements of Confucianism, Taoism and Buddhism, the temple manifests the essence of Chinese culture. In the sea west of the temple lie two reef islands: Big Stone Hill and Small Stone Hill, which provide a marvelous view of the sea. 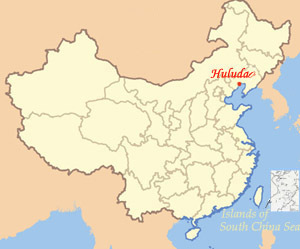 How to get there: Take the long distance bus to Suizhong Hydraulic Power Plant at the Huludao Central Bus Station, and get off at the Tianlong Temple Stop.